The Kraljicina Plaza hotel, located in the Milocer park, will be demolished, and another, bigger one, will be built in its place. The authorization for the demolition of the facility was issued by the Ministry of Sustainable Development and Tourism of Montenegro on Monday, August 14, 2017. The hotel was rented in 2007 by Greece's Adriatic Properties, owned by businessman Petros Stathis. According to the 30-year lease agreement, which was later extended by another 12 years, the renter obliged to demolish the hotel it had bought from HTP Milocer and raise a new one in its place. However, Kraljicina Plaza has only accommodated Adriatic Properties workers for ten years now. That same year, the company also rented Sveti Stefan and Hotel Villa Milocer, former summer resort of the Karadjordjevic dynasty, reconstructed the interior of those facilities and is now successfully running them. Kraljicina Plaza was built in the early 1980s for the needs of federal institutions and used to mostly accommodate high police representatives of the SFRY. Afterwards, it worked as an open hotel, and a pretty modern one for its time at that. Adriatic Properties intends to raise a new hotel here, featuring eight floors, as well as an annex, which should make the new complex four times larger than the old one. A total of 66 apartments should be built in the location, as well as 12 outside it. The construction in the Milocer park caused dissatisfaction among the former opposition, which is now in power in the Budva parliament, but also among the residents. The municipality once adopted the law on the ban on construction in the park. The government has now reached the decision on demolishing the facility, to the benefit of Adriatic Properties, which has already prepared the design documentation. The land for the future hotel complex will be leased for 90 years, and the construction works will probably start following this year's tourist season, as the ban on construction is in effect. The location beneath the old hotel, which also features a new spa center, is off-limits for residents and tourists. 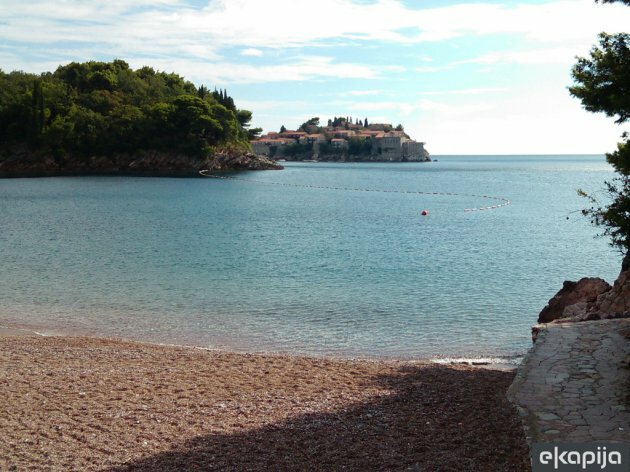 The situation at the King's Beach, as well as Sveti Stefan, is similar, as renting beach mattresses and parasols costs as much as EUR 100. This causes frequent incidents between the residents and the security workers, who don't allow people to enter the beach with towels only. Stathis has also bought the Maestral hotel in Przno, only 50 m away from Kraljicina Plaza. HTB Budvanska Rivijera, which owns Sveti Stefan and Hotel Villa Milocer, sold Maestral to the Slovenian company Hit from Nova Gorica. This company then started experiencing financial troubles and sold the luxurious hotel to Stathis two years ago, allowing the Greek businessman to create a small empire in Milocer and Sveti Stefan.